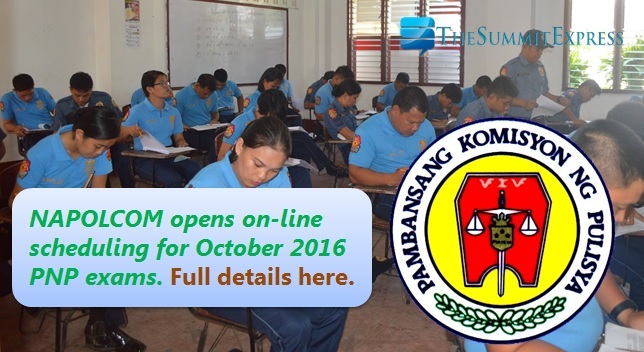 MANILA, Philippines - (Updated July 18) The National Police Commission (NAPOLCOM) on Monday, July 18, has opened the On-Line Examination Application Scheduling System (OLEASS) for the nationwide conduct of the Philippine National Police (PNP) Entrance and Promotional Examinations on October 16, 2016. NAPOLCOM said that (OLEASS) will be activated in the websites www.napolcom.gov.ph or www.napolcom-oleass.com on July 18 – 22, 2016 for the police entrance exam, July 25 – 29, 2016 for the Police Officer (PO) exam and August 1 – 5, 2016 for the Senior Police Officer (SPO), Inspector (INSP) and Superintendent (SUPT) exams. NAPOLCOM Vice-Chairman and Executive Officer Atty. Rogelio T. Casurao said that the OLEASS shall be opened at 12:00 noon onwards on Monday, July 18 for the PNP entrance exam, July 25 for the PO exam and August 1 for the SPO, INSP and SUPT exams. UPDATE 1: Due to influx of traffic, www.napolcom-oleass.com page went down. Users may try to refresh the page to get the form. The agency advised that acceptance of applications shall be on a ‘first-come, first-served’ basis and, upon due notice, may be stopped even ahead of the deadline. “The examination center where the applicant shall take the exam is automatically assigned by the computer system based on the home address or unit of assignment provided by the applicant,” Casurao said. The period of filing of application is from August 15 – September 9, 2016. Note that only applicants with a confirmed scheduled appointment with reference number shall be entertained. Civilian applicants must bring the printed letter-reply/corresponding reference number confirming the scheduled appointment; two recent, identical and color 1”x1” ID pictures with white background and complete name tag (for PNP members, the name tag should indicate the rank before the name); one legal size window envelope with P17 worth of mailing stamp; transcript of scholastic record with Special Order issued by CHED or diploma; and birth certificate issued by the Local Civil Registrar or National Statistics Office (NSO). For a PO1 with temporary appointment, a certified true copy of Attested Appointment, Plantilla Appointment or Special Order is also required for submission. Casurao pointed out that only duly accomplished application forms with all the required documents filed personally and received by the NAPOLCOM Regional Office on or before the deadline for filing shall be accepted. Applications received through postal mail shall not be processed. Examination fee is P400 for the PNP Entrance and Police Officer Examinations; P450 for Senior Police Officer Examination; P500 for Police Inspector Examination; and P600 for Police Superintendent Examination.